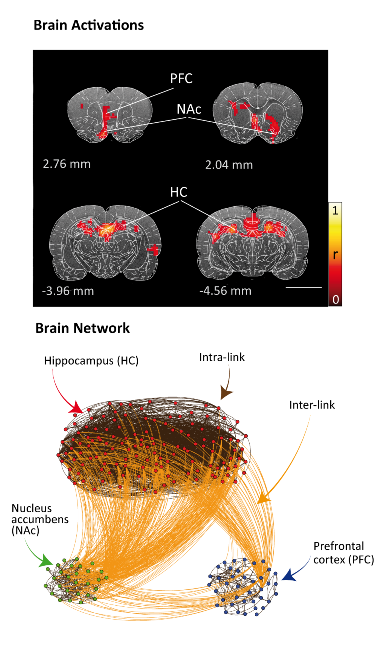 Finding influential nodes for integration in brain networks using optimal percolation theory. Gino Del Ferraro, Andrea Moreno, Byungjoon Min, Flaviano Morone, Úrsula Pérez-Ramírez, Laura Pérez-Cervera, Lucas C. Parra, Andrei Holodny, Santiago Canals & Hernán A. Makse. Global integration of information in the brain results from complex interactions of segregated brain networks. Identifying the most influential neuronal populations that efficiently bind these networks is a fundamental problem of systems neuroscience. Here, we apply optimal percolation theory and pharmacogenetic interventions in vivo to predict and subsequently target nodes that are essential for global integration of a memory network in rodents. The theory predicts that integration in the memory network is mediated by a set of low-degree nodes located in the nucleus accumbens. This result is confirmed with pharmacogenetic inactivation of the nucleus accumbens, which eliminates the formation of the memory network, while inactivations of other brain areas leave the network intact. Thus, optimal percolation theory predicts essential nodes in brain networks. This could be used to identify targets of interventions to modulate brain function.